I have searched and read several threads here. Looking for a mid sized tank bank to hold paperwork, change phone a couple of bottles of water and perhaps a couple of pairs of light waterproof trousers. For a euro tour with good lady. Appreciate the issues with bar turning lock and drop on rear of tank. Seen the Givi XS 307 mentioned by a couple of people. Just wondered how this worked out in practice. There appears to be some adjustment on the base plate to move it back/forwards on tank filler fitting and seems reasonable quality/price. 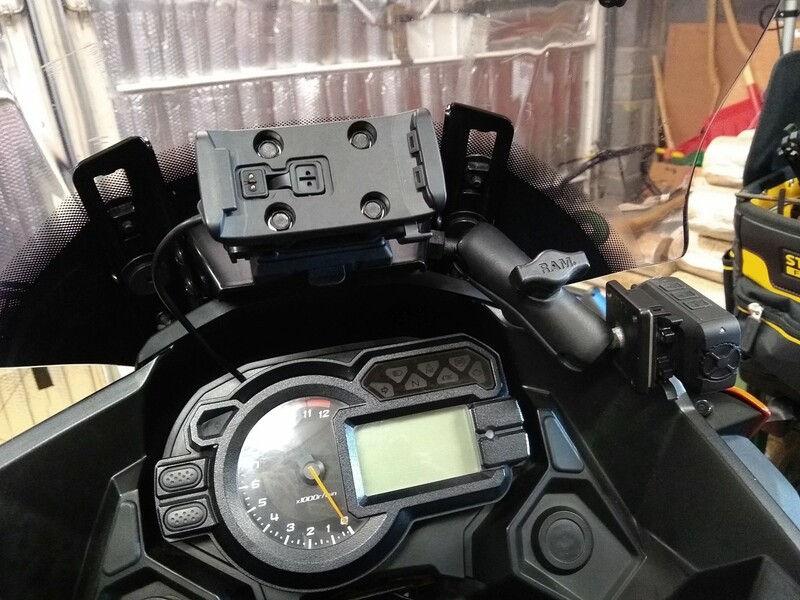 I have sat nav mounted on standard Kawa bracket on headstock. Good man for asking ... I have been pondering the same things myself this morning. I'm down to the SW Motech ION or the Givi. Having taken a tape measure to the tank, my highly scientific calculations (Mark 1 eyeball) suggest 27 cms long and 19cms wide is optimal. Like you, this is a phone, sunglasses, change and incidentals holder rather than luggage. The Givi ST602 Sport-T Tanklock Tank Bag is wider than I would like but looks as if t would do a good job. The ION and Evo from SW-Tech is a little narrower, but very much more expensive. 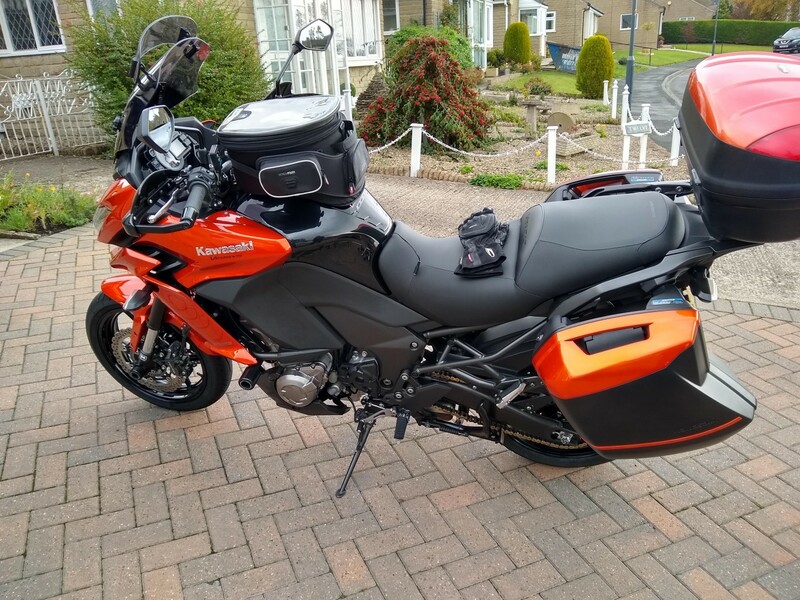 I've used the SW-Motech Quick Lock Evo tank bags on my last two Kawasaki's and have just bought and fitted one to my latest acquisition - a BMW K1300 GT. On the 1400 GTR I used a "Daypack", on the Versys 1000 the "City" and for the BMW an "Engage". I find the ability to lock the bag against easy removal and its security when attached are real plus points and the quality of the bag is second to none. Whilst I could have used the "City" on all three bikes, I have changed each time to the bag that most closely fits the tank shape of the bike concerned. The fit of the "City" on the Versys 1000 tank is superb, in my view. If I were ever to buy another Versys, I would equip it with the same bag again. I will be able to try the XS308 in a few days and I will let you know. GIVI seems like the best bang for the buck with a nice tanklock system but other than that, its really just how large of a bag you want. There are some comically gigantic tankbags out there. Givi EA112B Easy-Tsincelet Tank Bag with Magnet £36.99? I have got one of these. Have used it for maps and/or instructions. Holds an A4 nearly piece of paper. Good quality item. Would certainly hold "paperwork", tablet, phone and such like.